The Response to Intervention (RTI) process provides needed support for students who struggle with learning to read. For most students, Tier 1, depicted below, will be sufficient for literacy development. Tier 1 is defined as the core reading program, driven by rigorous standards and delivered with high-quality instruction. However, some students will need Tier 2 instruction to reach reading proficiency. 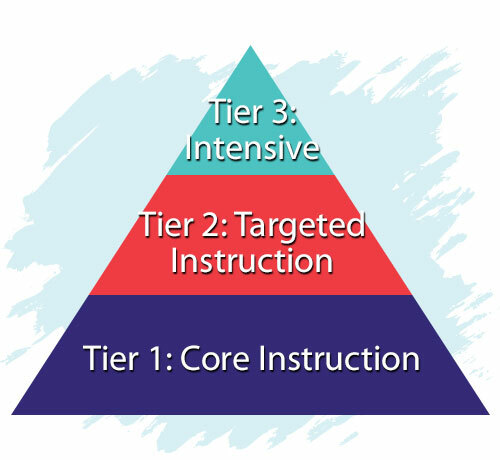 Tier 2 is supplemental instruction designed to provide extra support with basic reading skills. Experts estimate that 5-20% of students in the primary grades will need reading intervention. Tier 2 instruction for ELL students who experience early reading difficulty is critical and should include vocabulary and language support in addition to typical Tier 2 instruction focused on basic reading skills. Tier 2 reading intervention involves a 6-8 week cycle of assessment, intervention, progress monitoring, and decision-making, depicted below. A positive response to intervention leads to a decision to continue or exit Tier 2 intervention. However, when the response to intervention is not positive, meaning that the student has made slow or no growth, the team may decide to adjust the intervention or move the student to Tier 3 intensive intervention. Assessment. Screening assessments help to identify students who will benefit from Tier 2 intervention. Universal screening means assessing all students school-wide to catch those who are at risk of experiencing reading difficulty. There are numerous screening tools that are widely used. They are based on predictive validity-predicting positive or negative future reading outcomes. If we can predict with reasonable accuracy that an individual student is likely to experience difficulty, we have an opportunity to intervene early to ameliorate negative outcomes. Screening assessments are typically brief, timed tests of fundamental reading skills and scores are compared to established norms. Most established screening assessments have been validated for ELLs and can be used to identify intervention needs for individual students. However, it is important to take language proficiency into account and use classroom-based evidence to confirm intervention decisions. Progress monitoring assessments are administered frequently to provide important information regarding students’ progress, leading to decisions regarding students’ responsiveness to the intervention. There are widely used progress monitoring tools with established reliability and validity. These tools have norms and guidelines for making objective and consistent responsiveness decisions. Intervention. Using informal skills checks and information about classroom performance, intervention teachers provide small-group instruction that is supplemental to core instruction. Tier 2 intervention should provide high-quality explicit skills instruction that targets the specific needs of students. Possible skill areas include phonemic awareness, letter-sound and decoding skills, oral reading fluency, sight word acquisition, vocabulary and comprehension. Research on Tier 2 reading interventions indicates that intervention should be consistent and explicit. Tier 2 intervention for ELLs should include sufficient phonemic awareness and decoding intervention. ELLs often experience unique difficulties with distinguishing and pronouncing particular sounds in English. Informal diagnostic assessments of phonemic awareness and decoding provide important information about what skills to target, and interventionists should consult with ESL specialists to coordinate services. Provide intervention 20-45 minutes per session, 3-5 days per week, in 6-8 week cycles. Use screening and progress monitoring data to guide intervention decisions. Use evidence-based practices and high-quality curriculum materials. Focus on targeted skills needs of students. Establish small groups of 4-6 students per group to maximize student engagement and teacher feedback. In the RTI process, Tier 3 is for students with significant reading delays. Typically, only about 1-5% of the student population would experience severe reading difficulties. Tier 3 is for students who do not make sufficient growth with Tier 2. Most students will enter Tier 3 via Tier 2 progress monitoring procedures. Tier 3 intervention is more intensive than Tier 2. This means that the instruction is highly specialized and more individualized, focusing specifically on the assessed skill needs of students. It consists of smaller group sizes, increased time and focused language and skills development. Tier 3 instruction consists of evidence-based practices, but there are few curricular programs that are validated specifically for this purpose. Effective Tier 3 consists of instruction delivered by trained personnel who have the expertise to select activities and materials that best provide individualized, intensive instruction on targeted skills. Tier 3 intervention differs from Tier 2 in four important ways, depicted below. Compared to Tier 2, intervention in Tier 3 should a) increase the dosage, or amount, of intervention; b) take place in a very controlled setting that maximizes students’ focus; c) provide highly specialized instruction; and d) emphasize the metacognitive self-regulation aspects of the reading process. Assessment. There are three types of assessment used to guide the RTI system. Assessment data provide the basis for identifying students who need intervention, determining the focus of intervention instruction, and monitoring progress. Universal screening assessment is a systematic and objective way of identifying students who are at risk for reading difficulty. Screening assessments may be locally developed or nationally established tests with criteria, or cut-points, for determining risk. These assessments are conducted at the beginning and middle of the year. Screening data are used along with other classroom performance indicators to identify candidates for Tier 2 intervention. Informal diagnostic assessment tools provide information for intervention teachers to make decisions about what to emphasize in intervention sessions. These individualized assessments should cover essential developmental reading skills, including phonological awareness, letter and sound knowledge, decoding concepts, advanced word study skills, fluency, vocabulary and comprehension. Diagnostic assessment, along with observation of student read-aloud, help teachers to form intervention groups and design instruction to meet individual student needs. Progress monitoring assessment provides frequent checks of students’ progress toward specified goals. These assessments consist of short tasks that represent the identified area of need in the continuum of reading skills. Teachers chart the scores and use this information to adjust instruction or student goals. It is important for teachers to learn about the sounds of the native language of ELLs to learn what sounds may be difficult for students to recognize and pronounce. This will vary for ELLs of different language groups. For example, students whose primary language is Spanish are likely to have difficulty with beginning consonant sounds such as b, d, h, j, v, and w. They may also have difficulty with certain vowel sounds, typically short-i and short-e, like in sit and set. Students who speak Chinese often have difficulty with several sounds, such as ch, l, m and n, and consonant blends that have r or l, such as in bring and block. Effective intervention provides explicit and purposeful instruction on these easily confused sounds in oral phonemic awareness activities and in written decoding activities. Phonemic awareness and basic decoding are typically taught in the early primary grades, but may not provide enough focus on trouble sounds. Some ELLs enter Tier 2 intervention in later grades, and these skills are not taught in core instruction. ELLs in Tier 2 intervention are likely to need additional instruction focusing on these skills. Reading fluency is defined as reading with sufficient rate, accuracy and prosody (expression). Fluency can be described as reading smoothly and with ease. This requires more than basic word recognition skills. When we understand the meaning of text, we are more able to get the phrasing and expression right. Many ELLs are able to develop sufficient automatic word recognition, but still have difficulty with the vocabulary and meaning of the text, which slows them down and interrupts the flow. There are three types of research-based strategies for building fluency in ELLs: repeated reading, building in oral and written response to reading, and oral reading with corrective feedback. For ELLs, explicit vocabulary instruction is essential in Tier 2 intervention. Two research-based principles apply to teaching vocabulary in the context of small-group Tier 2 reading intervention. To learn new word with sufficient depth of knowledge, ELLs need 12 to 14 exposures to a word, with opportunities to use it in meaningful contexts. Effective vocabulary instruction involves encountering the target word in oral language, reading and writing activities. In other words, ELLs need to read, say and write the word multiple times in meaningful ways. ELLs need frequent opportunities to focus on meaning of text. Students learn how to comprehend text through teacher modeling and interactive, scaffolded discussion. For ELLs, reading intervention should include more opportunities to focus on reading for meaning with scaffolded support. Specificity of instruction is a defining feature of Tier 3 intervention. It is most effective when it is explicit, systematic and focused. Students with significant learning delays need additional practice, feedback and support to acquire skills and enact them with automaticity. Move systematically, step-by-step through needed skills. Maximize engaged learning time; minimize wait time and transitions. Maintain a specific focus on targeted skills. For ELLs, increase opportunities for read-aloud and interactive discussion of vocabulary and text meaning. There are various cognitive processes that occur during reading to direct thinking and learning. Students with intensive instructional needs often have difficulties with executive function or metacognition that impact memory, attention, motivation and strategy use. Good readers self-monitor comprehension while reading and self-regulate their motivation, attention and strategy use. Tier 3 intervention provides an optimal setting for teaching these skills because of the small group size and extended time. Screening assessments are based on predictive validity, meaning that performance on the screening assessment is a good predictor of later reading ability. For ELLs, it is important to know that the assessments used reliably predict later outcomes for ELLs, not just for native English speakers. If using nationally established screening tools, review the administration manual and underlying research to determine that the predictive validity holds true for ELLs. If using locally developed screening measures, consider the skills tested and whether they have been established with ELLs. For example, research has established that phonemic awareness in Kindergarten and grade 1 is a good predictor for native speakers of English and for ELLs, but established fluency norms may not be as reliable for ELLs as for native English speakers. The Resources section of this toolkit has valuable information regarding selecting screening measures. Intervention teachers need a clear picture of the strengths and needs of each student. Informal diagnostics help us to identify specific learning needs. They also help us to group students with similar needs to make the intervention more focused and efficient. Depending on the age or grade level of the students, we need information on each of the key areas of reading. Reading inventories, phonics skills assessments, fluency checks, and leveled passages are examples of informal tools. Intervention teachers, especially in Tier 3, will want to conduct passage reading to observe each student’s skills in context. Ongoing progress monitoring provides information about the response of students receiving intervention. If the response is positive, meaning that there is an upward trend, or growth, the intervention is having a positive impact. We can use the chart below to gauge a student’s responsiveness. We want to see the gap closing and have a clear picture of the timeline for meeting the goal of catch-up growth. To select appropriate progress monitoring assessments requires having accurate diagnostics to determine the right skills to track and the right level to use. Though we may teach several skills in intervention, we usually use only one or two progress monitoring tools. Generally, we want a measure that is an indicator of the desired outcome. Fluency, comprehension, and word reading are typically used. Typical progress monitoring assessments are brief and easy to administer, requiring only a few minutes per week per student. Select materials based on the student’s goal level.